Republican Leader Kevin McCarthy (CA-23) joined House Oversight Republicans Wednesday to introduce a resolution, sponsored by Rep. Mark Green (TN-07), that directs Chairman Elijah Cummings (MD-07) to submit an official copy of Michael Cohen’s congressional testimony to the Department of Justice for further investigation. 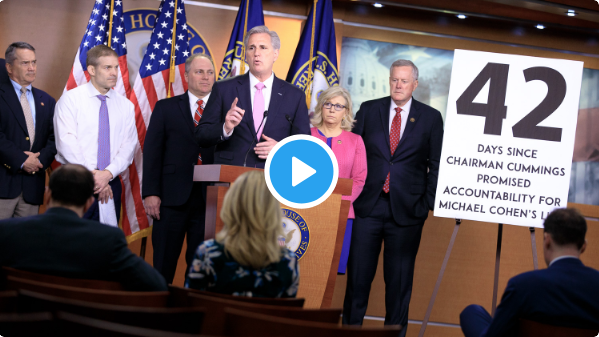 They were also joined by Republican Whip Steve Scalise (LA-01) and Republican Conference Chairwoman Liz Cheney (WY-AL). Highlights are below, or watch online here. “It was somewhat ironic that when it came to the announcement of the first hearing of the first witness of the Democrat majority, that they would pick somebody who is going to jail for lying. Before this man, Mr. Cohen, even raised his right hand to swear, he’d already lied. “Chairman Cummings said that he would be the first to refer him to the Department of Justice if he lied. There’s not one person in America who does not understand Michael Cohen lied that day. He didn’t lie once, he lied seven times. “I respect Chairman Cummings, I respect him based upon my working with him through the years. I do not understand, 42 days later, why he didn’t keep his word. “It’s not that we asked him to do something he said he would not do – he made a promise, not to those in the room, but to all of America. It comes to the integrity of this House — it’s not a partisan issue. This is about will you keep your word? We know Michael Cohen did not. We know the Chairman said he would be the first to refer him. That’s why we waited. That’s why we gave them the ability to do what they said they would do – to do what was right. “[…] what we’re doing today is very simple. What Congressman Green has done is take the Chairman at his word. The Chairman said he would be the first to refer. The reason why this hearing even took place early, is because they had to get [Michael Cohen] before them because he was on his way to jail. Had they waited a short time later, he would’ve been in jail.